Even though there are numerous pest sprays available, some pests are just too difficult to be eliminated from plants. However, gardeners know the little secret- DIY sprays are always the most effective! These homemade pesticides do not destroy the “garden pets”. 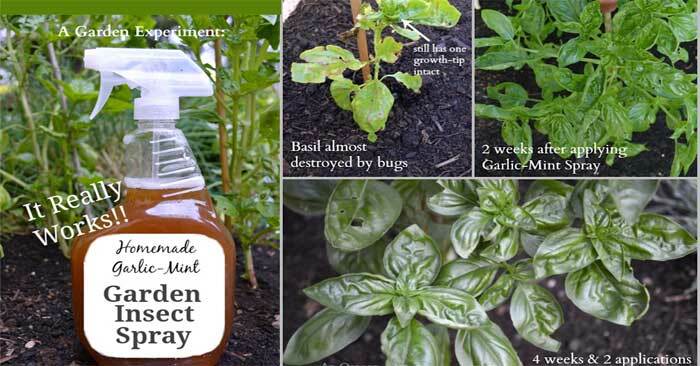 The one we recommend is really easy to prepare, and helps you get rid of even the bothersome garden insects. Moreover, it would be best if you prepare it now and have a fantastic garden area this spring season. The recipe was adapted from Keeper of the Home by Jami from An Oregon Cottage and it is excellent for all with a mint patch. Mint — spearmint and peppermint — is a popular herb with square stems, leaves with a specific scent and refreshing flavor. It grows from underground runners and thrives on abundant water. It depends on ample water, and even though it can be grown from seed, we suggest buying small plants. This economical, non-toxic pesticide is just perfect for the garden, s it has potent fungicidal and pesticidal properties which help you control pests. On the other hand, commercial chemical fertilizers reduce the capacity of the vital ingredients in garlic to fight pests, so make sure you avoid them. Garlic can be of great help in the case of ants, aphids, white flies, termites, borers, beetles, caterpillars, slugs and army worms. Natural insecticides can be non-toxic to humans and pets and safe for the environment. One such natural insect deterrent is certainly the red cayenne pepper. While bewildering numbers of organic products and homemade remedies exist to repel garden predators, a few “old stormy plants” are continually mentioned as insect and animal pests deterrents. Among them are red pepper sprays and powders, made from extracts of the hotter members of the Capsaicin family. Organic sprays and powders that use red pepper extracts are available at garden centers, but simple home methods may also deliver the power of red pepper to your organic garden. According to the Rodale’s Ultimate Encyclopedia of Organic Gardening, a red pepper spray or ground red pepper is a potent, broad-spectrum, organic treatment for numerous insect pests, including spider mites, aphids, lace bugs, and cabbage maggots. Red pepper sprays prevent the appearance of flying insects that feed on the fruit, leaves, and flowers. You can dust ground red pepper, or cayenne pepper, around the base of plant stems to thwart crawling pests that feed on seedlings, such as cutworms, and cabbage maggots. The National Pesticide Information Center often markets the red pepper as a deterrent for various pests that eat or damage trees, shrubs, and smaller plants, and even for those that break into outbuildings and garbage cans, including skunks, rodents, rabbits, dogs, deer, raccoons, and cats. It irritates the skin and lungs of rodents, and in this way, repels them without harming them. Add the garlic and mint in a food processor and blend them for several seconds. Then, transfer the mixture to a pot of 12 cups of water (2.8 liters). Add the cayenne pepper, and boil. Next, remove the mixture from heat and leave it until the next morning. Then, just strain it and pour it into spray bottles (or garden sprayer). In the end, add the dish soap, shake to mix it in well, and it is ready to use. Before use, make sure you shake the spray well. Then, pick a cloudy day or early in the morning, and spray the leaves of the plants in your garden, on the top and on the other side. After several days, apply once more, but in most cases, the effects are visible even after the first use. After the application of this pesticide, you will notice significant progress in the garden, and after one month, all your garden plants will be healthy and good as new! It is completely safe, so do not worry if your bushes and herbs will not be harmed! Just Spray This Oil And You Will Never See Mold Again!